DePauw University’s women’s soccer team (2-4, 0-0) secured their second win of the season Wednesday night, taking down Franklin College (2-2, 0-0) with a score of 1-0. Both teams saved all of their action that night for after halftime. Five minutes into the second half, in the 59th minute, senior Stephanie Martin received the ball from senior Chloe Jacobs, dribbled around her defender and buried the ball in the back of the net. Later in the half, Allie Amato for Franklin received a yellow card, putting the ball back in the Tigers' possession, where they again attempted to attack the net. Three Tigers crashed the goal, and Franklin’s goalkeeper collided with one of them, causing the ref to call a stop in play—exactly when Meredith Schoenfeld nailed a shot into the open net. The Tigers' second goal for the night wouldn't count. DePauw coaches and fans alike were not pleased with the call. Franklin’s head coach kept calling out to his players “keep knocking at the door” as DePauw’s defense stopped them time after time. 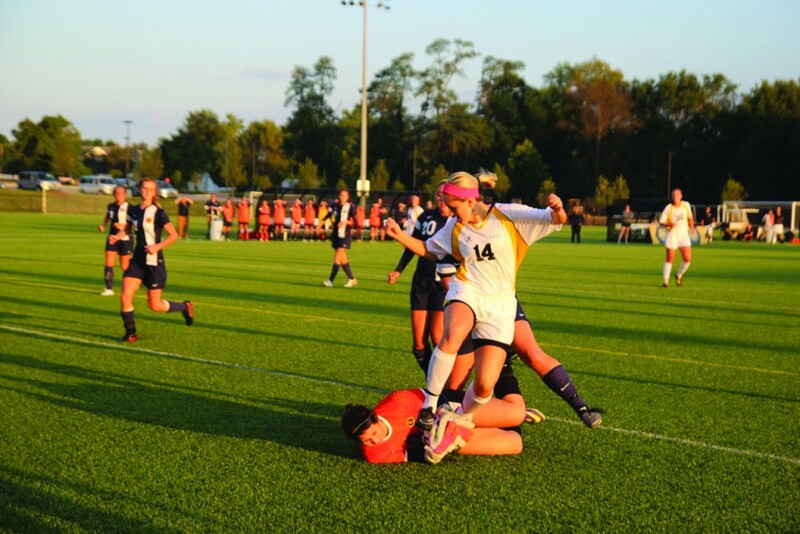 Just as DePauw was about to close out the game, Franklin’s Jessica Silva fired off a shot and broke her ankle. Silva's teammaes weren't the only ones affected by her injury. The Tigers sympathized with their opponents. After a 41-minute delay for the injury, the play resumed for the last 1:07 of the game. The Tigers held on for their second win of the season. In the second half, the Tigers maintained possession of the ball and gave themselves the edge in the game. In terms of the rest of the season, Martin has an idea on how to continue winning. The Tiger’s next game will be at Hiram College on Saturday evening as they open up NCAC play.